[128 Pages Report] The Aramid Fiber Market size was valued USD 2.91 billion in 2017 and is projected to reach USD 5.78 billion by 2024, at a CAGR of 9.9% during the forecast period. Aramid fibers are synthetic polymers with high strength bearing capacity and low density as well as can withstand very high temperatures and corrosive environments. Aramid fibers, on an average, are five times stronger than steel, have no melting point, and have dielectric properties. Owing to these unique properties, aramid fibers are used to effectively address requirements in industries such as defense, personal protection equipment (PPE), and automotive. In this report, 2017 has been considered the base year for the study of the aramid fiber market while the forecast period is between 2018 and 2024. Both, top-down and bottom-up approaches have been implemented to estimate and project the size of the aramid fiber market during the forecast period. The size of the aramid fiber market has been calculated, and weightages have been assigned to various market segments. This has been performed based on extensive primary interviews and secondary research of the information available on websites of various associations, such as the Fiber Society, CIRFS European Man-Made Fibres Association, American Fiber Manufacturers Association (AFMA), Synthetic Yarn and Fabric Association, the Fiber Optic Association. Primary research includes extensive interviews with key personnel such as chief executive officers, vice presidents, directors, and executives of the leading players operating in the aramid fiber market. After arriving at the overall market size, the total market has been split into several segments and subsegments. Data triangulation and market breakdown procedures have been employed to complete the overall market engineering process and arrive at the exact statistics for all segments and subsegments. The breakdown of profiles of primary respondents has been depicted in the figure below. The ecosystem of the aramid fiber market comprises raw material suppliers, manufacturers, and end users of aramid fibers. The aramid fiber value chain starts with the selection of appropriate raw materials. Raw materials play a significant role in determining the final properties of aramid fiber products and thereby their usage and the application in which they can be utilized. The technology for producing aramid is patented by manufacturers but is more or less the same with some modifications. The basic aramid fiber which is manufactured by the above-mentioned raw materials is an intermediate through which other products are manufactured. Aramid fibers manufacturers include DowDuPont (US), Teijin Ltd. (Japan), Toray Industries Inc. (South Korea), Hyosung Corp. (South Korea), Kolon Industries Inc. (South Korea), Huvis Corp. (South Korea), Yantai Tayho Advanced Material Co. (China), Kermel (France), China National Bluestar (Group) Co. Ltd. (China), Taekwang Industrial Co., Ltd. (South Korea), and SRO Aramid (Jiangsu) Co. Ltd. (China). In September 2018, Teijin Ltd. (Japan) launched a new fabric in collaboration with Snow Peak Industries (Japan), an outdoor clothing industry. This new fabric is developed using Teijin's meta-aramid fiber Teijinconex neo. This helped the company to expand its application areas in diverse fields. In July 2018, Yantai Tayho Advanced Materials Co. (China) invested USD 89 million for the expansion of para-aramid manufacturing facility in China. The operation in this facility is expected to commence in 2020. The expansion will help the company to strengthen its market position in China as well as globally. In March 2017, DowDuPont Inc. (US) entered into an agreement with Nitro Circus (US), an action sports company for its Kevlar brand. This agreement helped the company to expand its application areas into high-performance sports apparel and equipment. Which new product types of aramid fibers are companies developing? The aramid fiber market is projected to grow from USD 3.28 billion in 2018 to USD 5.78 billion by 2024, at a CAGR of 9.9%. Aramid fibers are high-performing synthetic fibers with very high tensile strength and strength-to-weight ratio as well as excellent flame and heat resistance. These fibers are employed as reinforcement for tires and plastics, cables, ropes, and as a substitute for asbestos. They are also used in the production of bulletproof vests and fireproof clothing. The end-user industries for aramid fiber include military & defense, telecommunication, and automotive, among others. There is also an increasing demand for aramid fibers from emerging economies, such as India and China, which is expected to fuel the growth of the aramid fiber market, globally. Para-aramid fiber and meta-aramid fiber are the two types of aramid fibers. The superior properties of these fibers make them suitable for a large number of applications that require the product to be lightweight and strong; due to this, they are used in the security & protection applications such as in helmets, ballistic protection, and chest shields; and automotive applications such as frictional materials, rubber reinforcement, and tire reinforcement. The aramid fiber market has been segmented on the basis of type, application, and region. Among types, the para-aramid fiber segment is expected to lead the market during the forecast period, in terms of value. The growth of this segment can be attributed to the increasing demand in the security & protection application owing to the increasing concern for health and safety of defense personnel and industrial workers. 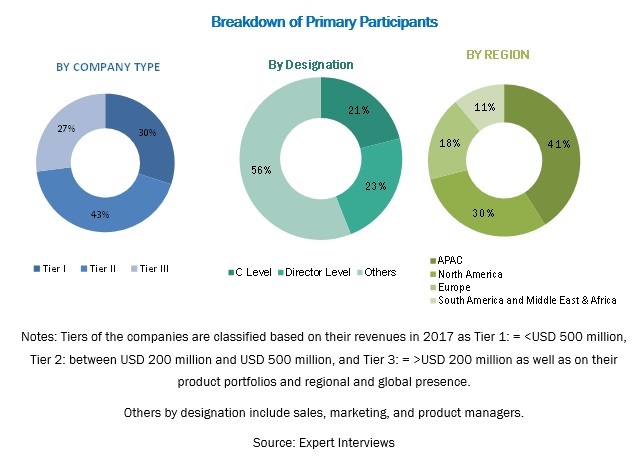 The meta-aramid fiber segment, on the other hand, is projected to register the highest CAGR between 2018 and 2024, owing to the increased usage of meta-aramid fiber in industrial filtration in the oil & gas and petrochemical industries. The aramid fiber market has been studied for North America, Europe, Asia Pacific, South America, and the Middle East & Africa. Europe is estimated to be the largest market for aramid fiber in 2018, and the region is also expected to continue leading the market till 2024 owing to the increasing environmental and government regulations in the automotive and defense industries. The Asia Pacific market is projected to register the highest CAGR, in terms of value, between 2018 and 2024. 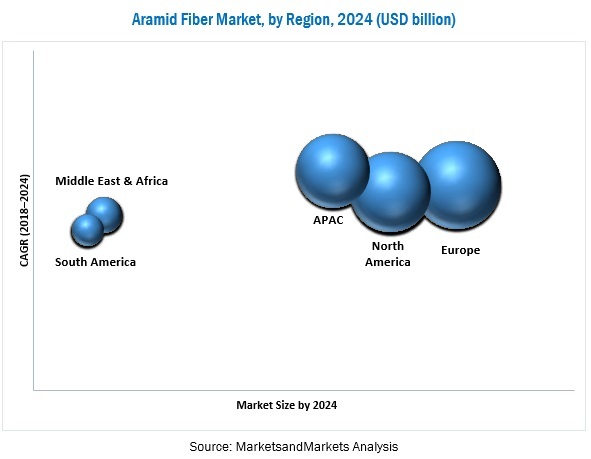 The growing infrastructure, telecommunication, and automotive industries in emerging economies such as China, India, and South Korea, is expected to drive the aramid fiber market. Aramid fibers are used for military, industrial, and civil purposes. The need for thermal and ballistic protection is rising in civil law enforcement and armed forces owing to increasing insurgency and terrorism. The stringent regulations enforced by the government and other agencies in developed economies, such as the European countries and the US, play a pivotal role in driving the aramid fiber market. Aramid fibers are being increasingly used as frictional materials to enhance strength, productivity, and durability of products. These fibers are used in the automotive industry to manufacture lightweight and durable cars, buses, and heavy vehicles. The application of aramid fibers reduces fuel consumption and enhances speed, durability, and stability of the vehicle. Aramid fibers are used in industries, such as petrochemical, cement, and steel, for the treatment of waste gases. The increasing pollution levels in many developed as well as developing regions are reaching an alarming stage. Such a scenario is one of the main factors for the growth in demand of aramid fibers. What are the expected mid- to long-term impact of these developments on the industry? What are the upcoming strategies of the key players in the aramid fiber market? Significant investments in R&D activities to develop aramid fibers and highly consolidated market with the presence of well-established market players make the intensity of competition in the market very high. High production costs incurred restrict the adoption of aramid fibers. Expansion & investment has been the major developmental strategy adopted between 2014 and 2018 by the key players operating in the aramid fiber market. Companies such as DowDuPont (US), Teijin Ltd. (Japan), Toray Industries Inc. (South Korea), and Hyosung Corp. (South Korea) have adopted the strategy of expansions & investments to strengthen their market presence and customer base as well as gain a competitive edge in the market. These companies also focus on investing in R&D activities to introduce new and cost-effective materials to meet the changing consumer needs. 10.3 Yantai Tayho Advanced Materials Co.
10.9 China National Bluestar (Group) Co., Ltd.
10.10 Sro Aramid (Jiangsu) Co. Ltd.
10.11 Taekwang Industrial Co., Ltd.